Remained in the family until 1991. 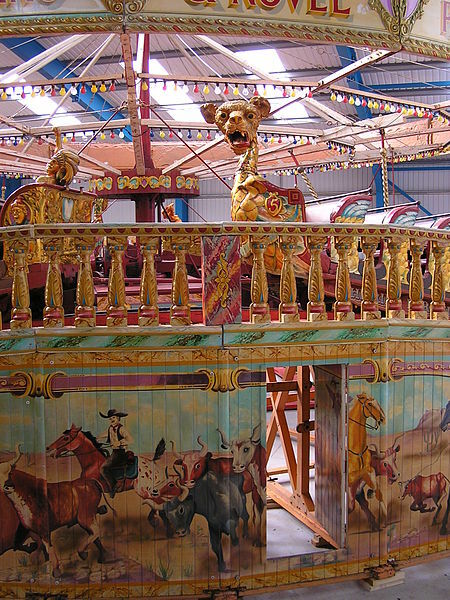 Over the summer I visited the Dingles Fairground Heritage Centre in Devon, England, a charitable trust whose mission is to collect, restore and preserve old fairground rides and the unique fairground art from the golden age of the travelling shows. It’s a wonderfully nostalgic place, filled with old carousels, switchbacks and the wagons in which the show people lived and travelled. 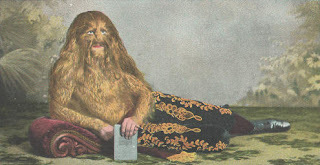 This working museum also records the history of the sideshows many of which would be deplored today, such as ‘The Lion-faced Man', whose real name was Stephan Bibrowski, (1890-1932) His body was covered with long hair and he displayed his gymnastic skills for those who paid to see him. Also popular were Billy Wood’s boxing matches from 1930’s, when he’d offer £1 to any member of the audience who was still standing after six rounds with one of his boxers. Amazingly, he always got plenty of volunteers. But what delighted me the most was seeing a ghost train among the collection of rides. It brought back childhood memories of sitting in a rattling carriage as mock cobwebs trailed across my face and doors swung open to reveal unconvincing cackling skeletons. Ghost trains have their origins in the ‘dark rides’ which first appeared in 19th century and were known as scenic railways, old mill rides, or tunnels of love, in which people travelled through a dark tunnel on trains or in little boats in water-filled channels, passing illuminated scenes that used trick perspectives, doors and screens to make the scenes look bigger than they were. In 1901, the American public could take ‘A Trip to the Moon’ and in 1928, the Pretzel Amusement Ride Company patented the first electric-rail ‘dark ride’. 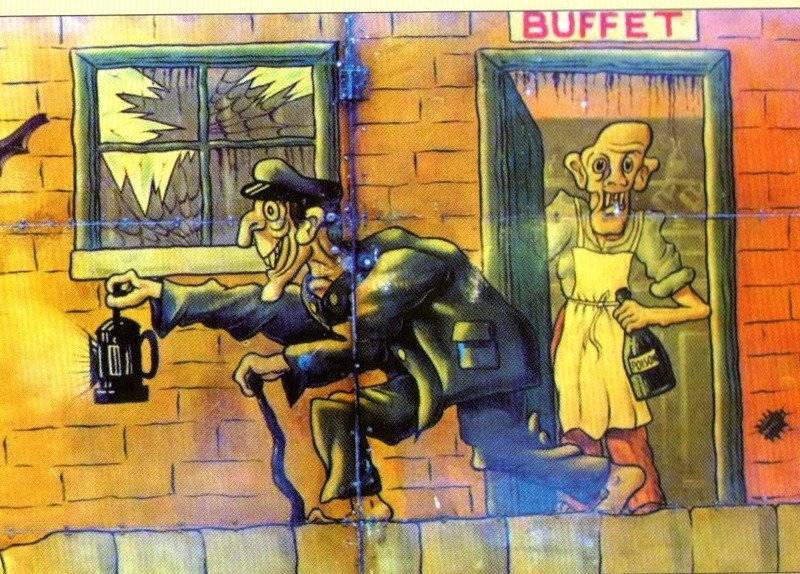 But the first ride to be given the name ghost train, was built for Blackpool Pleasure Beach by Harry Kamiya in 1930. The ride was originally named the Pretzel. It didn’t attract much attention, because few in England had ever heard of either the snack or the company. But back in 1923, the English actor and playwright, Arnold Ridley had written a play called The Ghost Train, about a group of railway passengers stranded in a rural station overnight. The play ran for over a year in London. It spawned a novel and many film versions, the earliest, in 1927, being a silent movie. The plot also appeared to inspire rash of thrillers based on the 'strangers trapped together on trains' scenario, such as Murder on the Orient Express, The Lady Vanishes, and Night Train to Munich. Arnold Ridley wrote the play after becoming stuck overnight at the isolated Mangotsfield railway station in Gloucestershire. The station was deserted but, thanks to a curve on the adjacent mainline track, in the darkness Ridley could hear the express train on the by-pass line as it approached Mangotsfield and then thunder passed. But he never saw the train, which must have been unnerving. The play he wrote was about a group of passengers who find themselves stranded in the station waiting room. The Station Master tries to persuade them to find accommodation in the village several miles away, but when they refuse to walk there, he warns them of a ghost train that haunts the line after a fatal train crash. He tells them the train brings death to anyone unlucky enough to see it. The passengers don’t believe him and insist on staying. At the end of the play we learn that tale has been invented to scare the public away from seeing a real train which Soviet terrorists are using to bring illegal arms into Britain. One of the passengers turns out to be a British secret agent sent to foil the dastardly plot that night. Much of the success of the play came from the elaborate special-effects creating the illusion of a ghostly train passing near the audience, by using garden-rollers running over wooden laths and thunder sheets. In 1931, skilfully capitalising on the fame of the play and films, as all good showmen know how to do, the Pretzel ride in Blackpool was renamed The Ghost Train and it proved so popular that ghost trains were soon in operation in show grounds throughout England. 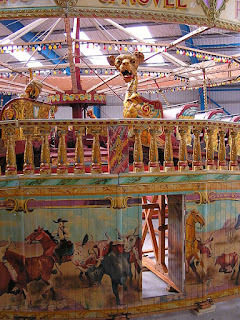 at the Dingles Fairground Heritage Centre. 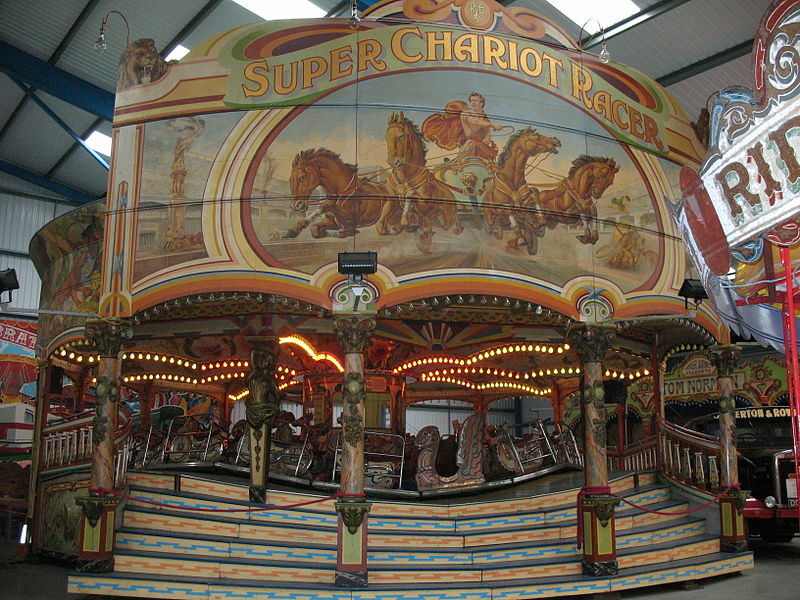 The original play may have fallen out of favour, but the fairground ride that took its name lives on, not least in the imagination of many TV film makers, who love to set clandestine meetings inside the ghost train tunnel or have murders committed on the little train, so that giggling customers emerge into the light only to discover one of fellow passengers has been dramatically stabbed. I think Arnold Ridley would be delighted. 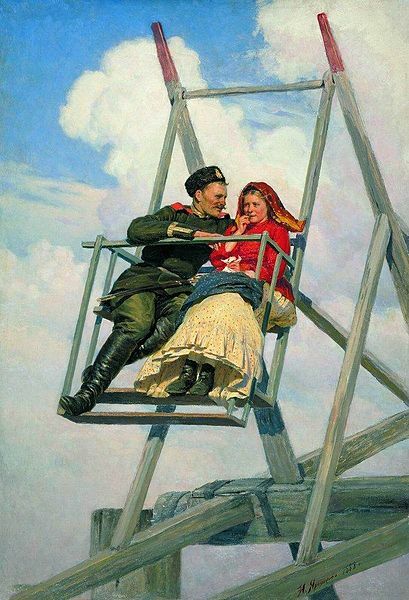 Who would have thought of such an origin for the fairground ride? I'm afraid the ghost train at Luna Park in Melbourne is very shabby. 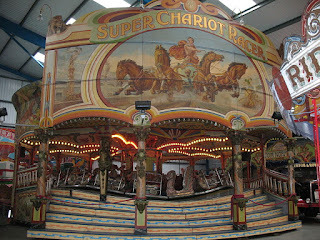 The only thing that scared me last time I rode it, with a younger family member, was the fact that there was only one safety rail(of course, my niece sat on that side)and I had to hang on for dear life to the back of the car to avoid being thrown out at the twists and turns. There is no way I will ever ride it again till safety measures are taken!